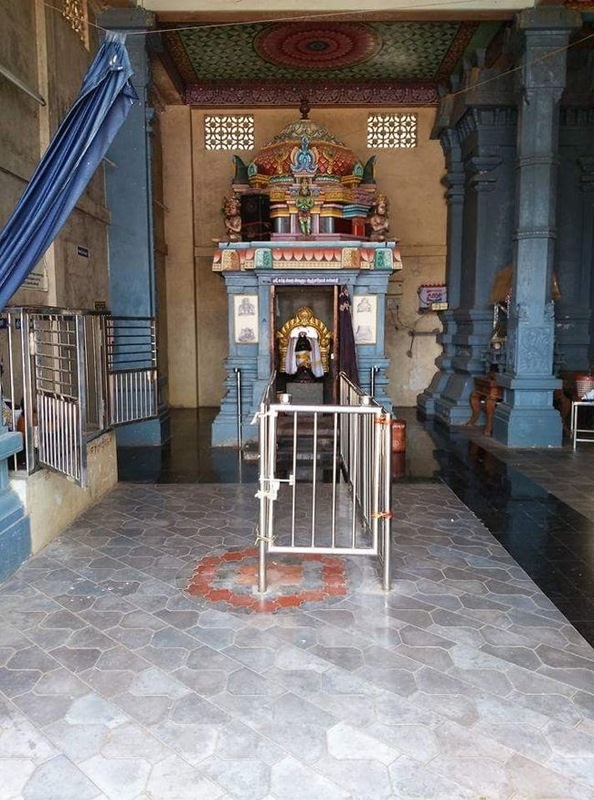 Sri Sapthaswara Anjaneya Shrine is present inside Vanamutti Perumal Temple located at Kozhikuthi Village near Mayiladuthurai town in Nagapattinam District of Tamilnadu. Vanamutti Perumal is also known as Sri Srinivasa Perumal, Kozhikuthi bestows Peace, prosperity, happiness and wealth. The temple is more than 1400 years old. This is a temple for liberation from Sani Graha Dosham and all kinds of Skin Diseases. Sri Anjaneya in this temple is called Sapthaswara Anjaneya as seven musical tones can be heard while touching the idol. Lord Hanuman is also seen with his tail curled to head and a bell is hanging at the tip of the tail. There is a separate shrine for Lord Anjaneya (Hanuman) in the temple. Normally a devotee will find the shrine closed on three sides and the facing side only open. But in this kshetra one can see the back portion of the Lord also. Lord Hanuman’s tail is seen raised till His head and there is a small bell in end of the tail. The Lord is seen standing is a ‘ullasa bhava’ with His left leg slightly folded in a easy way and His right leg is seen secured to the ground. Thandai adorns the lotus feet of the Lord. Wearing a katcham, over which a uthriyam is tightly fastened over which there is a weast ornament. The two palms are held together in a ‘pranam’ posture. His adorns ‘kankanam’ in wrists, ‘keyuram’ in the upper arm, and bhujavalaya on shoulders. Lord is seen wearing ‘yagyopaveetham’ and His neck is adorned with five different types of mala. He is seen wearing ‘kundala’ in His ears which is crowned with ‘karna puspha’ and His kesa is neatly tied with a ornamental ‘kesa bandha’. Lords ‘pingaksha’ is bright large and glowing bestowing benevolence to the devotee. 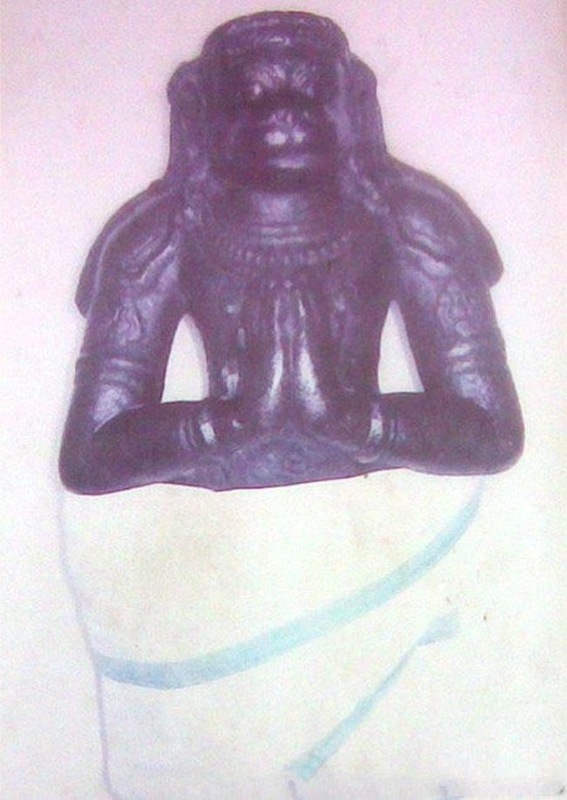 The Lord Sri Anjaneya of this kshetra is known as ‘Sapthaswara Sri Anjaneya’. While it is known in archaeology that many temples in India have pillars which can produce musical tones. In all these cases there will be different pillars to produce each note. But as a peculiar case this Lord Anjaneya produces all the seven notes of 'sa ri ga ma pa tha ni' when tapped at different places of the deity. This is a unique feature of this deity and probably only one in India. Many musicians used to visit the temple regularly. Musicians and dancers who lit the Ghee lamp is assured of success in their profession.